Prepare Spice Rub and Cranberry Chimichurri. Trim pork of any silverskin and dry with paper towels. Rub tenderloins with olive oil, then crust with spice mix until evenly coated. Heat a cast iron pan with canola oil over medium-high heat. Cook pork in pan, turning every 5 minutes, until tenderloins are browned all over — approximately 15 minutes. Insert thermometer into thickest part of tenderloin until it registers 145 degrees. Allow to rest 10 minutes. Cut into 1-inch medallions. 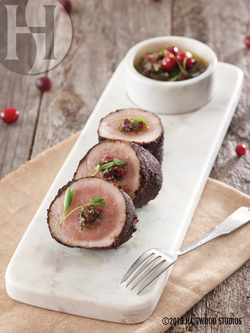 Drizzle with Cranberry Chimichurri to serve. Combine all ingredients in a small bowl and mix thoroughly. Set aside. Combine all ingredients in a small bowl and mix thoroughly. Allow to sit for a half hour.